We first came across Salvia corrugata while visiting a garden in Kew. Immediately attracted by the brilliant blue flowers, on a closer look the leathery foliage also attracted us. Said to be relatively new in cultivation, it has only been around since the early 1990s, however with the attractive flowers it has become a garden favourite. From Peru and Columbia, this is a plant that thrives in cooler climates as is grows naturally high in the mountains. It gets the name ‘corrugata’ from the texture of the leaves which are heavily ribbed. It is the flowers that are main attraction, appearing in whorls of a very attractive blue. Sometimes also called the ‘Ribbed Sage’. The flowers attract bees and birds to the garden. Humus rich soil, add some well rotted compost if needed. Dig a hole larger than the container, this loosens the soil and allows for faster root development. Plant back fill and firm in well. 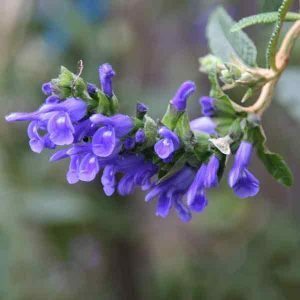 Salvia corrugata – Summary Information. Height – Generally reaches around 1.5 metres, however up to nearly 3 metres in ideal conditions. Spread – Will spread to form a bushy clump to 1.5 metres across. Flowers – A bright cobalt blue from autumn to winter. Foliage – Mid green and leathery in texture, heavily ribbed. Best pruned after flowering to maintain a bushy habit. We like to prune it to around 1m in height. However we have also seen good specimens at 2 metres.